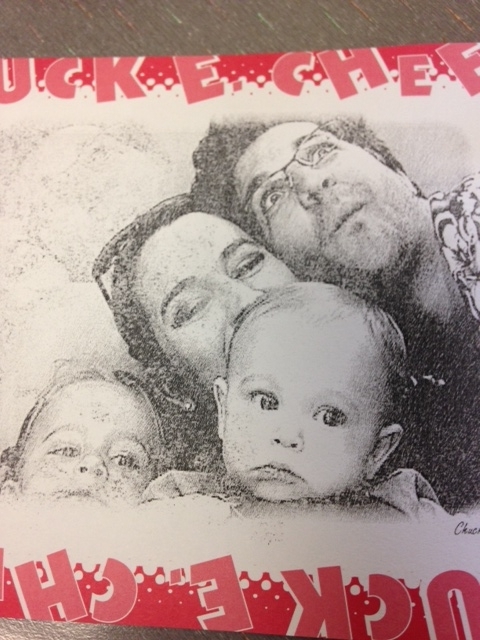 We had a play date at Chuck E. Cheese on Saturday with some friends of ours. We hadn’t been in a while and since this was to be a “down” weekend, it seemed like a great idea. We showed up right at 9:00 when they opened, hoping to beat the madness. The first hour was great. Then the hoards of birthday partiers showed up and things started getting gnarly. 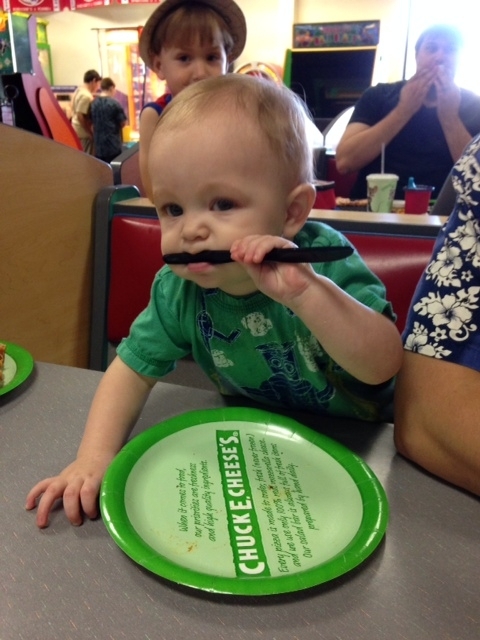 Yes, my boy is chewing on a knife. What you can’t see is that I have poor Stella in a choke-hold trying to get/keep her in the picture. As we prepared to evacuate very quickly, I was near the exit with Felix while Will wrangled Stella. There was a young man working the door (yes, CEC is like a bar with a bouncer, only their job is to keep people IN) who looked at me and asked if I was a schoolteacher. I kind of laughed and said I had taught briefly a long time ago and figured the guy was mistaken. Sure enough, however, he used the name of my old school as well as my old name. I was floored. This IS my best teacher eyebrow. When that didn’t work, I’d run my fingernails down the chalkboard. True story. He said that I had written him a note once that he still remembered to this day. In fact, he said, he thought of it often. I asked him what I had written. He said I had put “Thank you for being a bright spot in an otherwise bad day” on his paper. He said that had meant a whole lot to him. Y’all, I almost cried. I hugged this poor kid (who no doubt thought I was nuts) and thanked him. You have to understand. I only taught this boy for 3 months. I quit on Halloween 11 years ago. I was afraid to tell any of the kids I had decided to leave since discipline was already such a nightmare for me. The thought of telling kids hopped up on pounds of candy that I was a lame duck teacher for one final day was too terrifying. I’ve always felt pretty guilty about that. While many of those students were lost to me, I did have several that responded well. They must have felt pretty abandoned. I’ve always felt regret that teaching didn’t work out for me. I think if I had ended up in a different school or in a different region, it would have been different. Teaching is exciting. It’s profound. Sure, what I do is kind of important, I guess, but it’s not teaching. I’ve had all kinds of mixed emotions about running into my former student. On one hand I’m gratified that I made a bit of a difference for him, even if it was just a written pep talk on the top of a quiz. On the other hand, I wonder if I made a terrible mistake so many years ago. Maybe I was a chicken and cut and ran too quickly. Who can know? It’s too late to change directions now. Even if I wanted to, my family needs my paycheck and now that I have my own children my main focus is on their education. Selfish but true. But I’m glad I left a little bit of a mark. 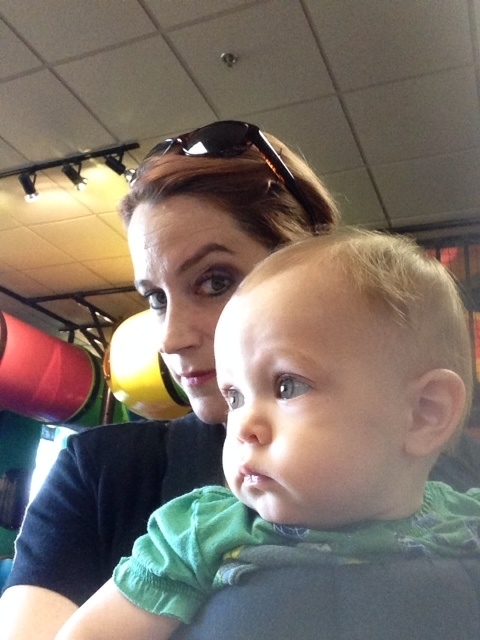 This entry was posted in life, Parenting, work and tagged Chuck E Cheese, teacher. Bookmark the permalink.